1. Preheat the oven to 200°C, gas mark 6. Pierce the whole sweet potato all over with a skewer and bake on a small oven tray for about 45 minutes, until tender. Set aside to cool slightly then peel, discard the skin and crush the flesh in a large mixing bowl with a fork. Turn the oven down to its lowest setting. 2. Meanwhile, make the maple butter. Beat 1 tbsp sugar into 30g butter fairly hard using a small wooden spoon for 3-5 minutes. Then beat in the maple syrup drip by drip so that you don’t curdle the mixture; set aside. Mix the cool sweet potato with the milk, egg and remaining 1 tbsp sugar. In a separate bowl, combine the flour, baking powder, cinnamon and a pinch of salt. Make a well in the centre and add the sweet potato mixture, gradually incorporating it into the dry ingredients from the edges to form a smooth, thick batter with a soft dropping consistency. 3. Place a large, non-stick frying pan or flat griddle over a medium heat. Use a rolled-up cylinder of kitchen paper to wipe ¼ of the remaining butter over the pan surface. Working in batches, add heaped tablespoons of the batter to the pan, spacing them out well. Cook for 2 minutes, until set at the edges and golden underneath, flip with a spatula and cook for 1-2 minutes more until the second side is golden. Keep warm and loosely covered with foil in the low oven while cooking the remainder. 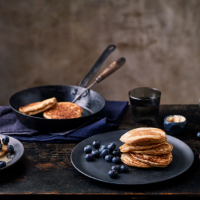 Serve the hotcakes in stacks with dots of maple butter spooned between them and on top. Add a dollop of Greek yogurt and some blueberries, if liked.